Bird Feeding is the number one hobby in America! Birding is the art of finding and studying birds. Birders commonly differentiate themselves from birdwatchers. The difference is in the amount of dedication and intensity, elevating a hobby into a passion. While Birders are more focused on finding and studying birds, birdwatchers are content with a more general observation of birds. Sometimes we need a break from our hectic lives. Birding is a unique and beautiful way to escape into an oasis all your own. Birding does require patience, and patience is a virtue! For those who are committed to being this earnest, don’t forget to keep a journal and report your findings to a local nature conservancy. You may make history! Birding has been noted since the stone age, as seen in drawings (hieroglyphics) that still remain. The letter A () or “Avian” is represented by the figure of a bird (). This widely spread sport was focused in the 20th century in the Atlantic seaboard region of the United States. It was influenced by many, such as Roger Tory Peterson and Ludlow Griscom. In the mid- to late 20th century many of the pioneering influences came from California, one of those being Guy McCaskie. If you note all your findings and routinely report them, maybe your name will be remembered for generations to come. To begin birding, all you need are three items: binoculars, a field guide and a blank notebook. Report your findings! Contact your local nature conservancy with your sightings. Also a convenient website (no affiliation with Delhi Flower & Garden Centers) is www.virtualbirder.com/vbirder/realbirds for all North America… report your sightings there, find other sightings, and more. Once you know what birds live in your area and when, find out what type of habitat they favor for feeding, breeding and raising their young. Having birdfeeders, birdhouses and birdbaths in your yard will certainly make them easier to see. For the most part, early morning is the best time to see most birds, unless you are looking for nocturnal species. Seasons also play a big part. Spring and Fall are their migration seasons, making that a perfect time to spot birds flying long distances and visiting your neck of the woods for a rest. So keep your eyes open… you may get the chance of a lifetime and see something very rare! Keep your camera handy! Identifying birds may begin even before you can see them… by their sound. We encourage you to select a protected nature commons nearby, and listen to the birds. If you hear a sound you can’t identify, sit quietly and watch, eventually the singers will show themselves and you can use a field guide to discover what bird it is. Binoculars are always useful too. Birds are picturesque creatures that bring a charming ambiance and alluring melody to our everyday lives. Keep in mind the old saying “stop and smell the roses”…stop and watch the birds! Make a special place for them to call home while you kick back and enjoy watching them. Set up a birdbath, provide a birdhouse or nest box (also known as a roost box), and make a place for them to settle in. Also, set out nesting materials and fresh water. This will bring the birds in and keep them coming back for a long time to come. There are also many common flowers that attract birds such as Echinacea (coneflower), Coreopsis (tickseed), Cosmos, Rudbeckia (black-eyed Susan), Ornamental Grasses, Marigolds, and Zinnias. About 80 species of birds nest in cavities (bird’s den). These would also be likely to nest in a birdhouse (nestbox, roost box, bird’s den). If a particular bird does not use a bird’s den in the wild then it probably will not use a nestbox. Nest boxes can be homemade or purchased. Some basic features to look for include: untreated wood (pine, cedar, etc. ), extended- sloped roof, rough or grooved interior walls, recessed floor, drainage holes, ventilation holes, easy access for monitoring and cleaning, sturdy construction, no outside perches. Make sure the design of the nestbox will be easy to check and clean. Also, make certain the size of the birdhouse hole is appropriate for the type of bird desired for the house design. Face your birdhouse away from the prevailing winds of spring and summer, if possible. 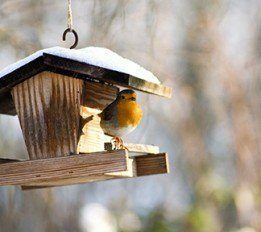 Also place the birdhouse where there is a nearby tree or bush; they may sit outside the birdhouse at times, watching the area for danger from which to defend their home. Taking a few simple measures to ensure that birds are safe from unwelcome predators such as feral cats, raccoons, snakes, squirrels, and nuisance birds can go a long way in avoiding aggravation and heartache for the birder. Place birdhouses on a steel or PVC pipe a minimum of 4 feet from the ground to prevent climbing animals that may harm birds. Never grease or oil the pipe. A better option is to place a metal baffle, or collar, on the pole just beneath the birdhouse to make access to the birdhouse difficult for predators. Implement these tips and you will have happy and safe birds! Birding etiquette involves unlimited patience and absolute silence. Being noisy and alarming to the birds entirely defeats the purpose of trying to observe them. Stay far enough away from the birds so as not to flush or disturb them, so that they can be photographed and noted with ease. Stay on existing paths. Do not burden fragile habitat and have respect for private property… ask permission first and keep it clean! Always behave in a manner that assures that when it’s time to return you will be welcomed back! More common resources such as your local library, the World Wide Web (Internet), and bird magazines are a great way to learn about birding and all it entails. Learn at your own pace or dive right in by visiting nature centers and local parks. Some have experts on site to help you identify species, answer your questions, and inform you of what birds to look out for. So don’t be shy, just ask… that’s what they are there for.